In a diversified country like ours, different cultures and traditions culminate and exhibit vibrant hues. It is an age old tradition, a custom for the Indian women to change their maiden or surname or both after marriage representing a new identity and signifying the beginning of a new life. Women generally adopt the family name of her husband by opting chnage of name. In some communities, for example, the Sindhis, the husband renames (first and last) his wife as a part of proceedings during marriage. Whatever the reason be, one may change name whether voluntarily or otherwise, we must understand the legal and social obligations of living with a new name. One’s change of name must be legally represented. By mere proclamation of change in name, one may not be able to enjoy the benefits and may face legal challenges after matrimony. Remember, there is no law in India, under any religion that dictates terms regarding name change after marriage nor is it mandatory. Let us take you through the nitty-gritty of getting a legal recognition to changing the name after marriage. It’s simple and somewhat quick. In the best interest of getting a marriage certificate, ensure completion of the procedure below before applying for one. The name change is more or less a three-step process that can be finished in a little time if followed judiciously. The first step is preparing an affidavit, which can be prepared online in a matter of minutes. When To Use Affidavit For Change Of Name After Marriage? Affidavit for change of name after marriage is intended for a woman who wishes to take on her husband’s family name. This is different from the general affidavit for change of name which can be used by any individual who wishes to change their name for astrological or whatever reason they see fit. After marriage, most women commonly change their surname alone, but in some cases, both first name and surname would be changed. In such cases, they are expected to prepare an affidavit for change of name post marriage, print it on Stamp paper and get it sealed by a notary. 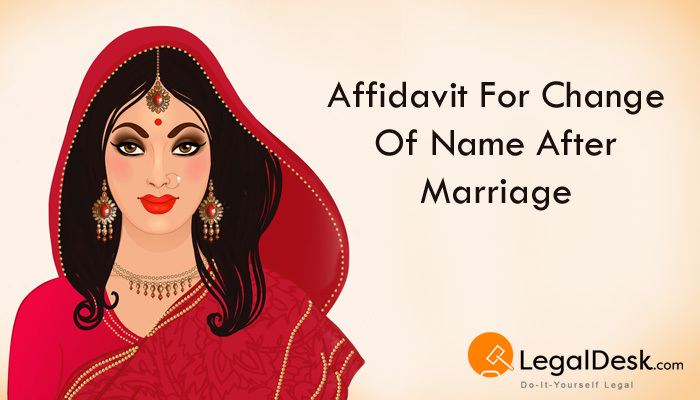 How To Use Affidavit For Change Of Name After Marriage? 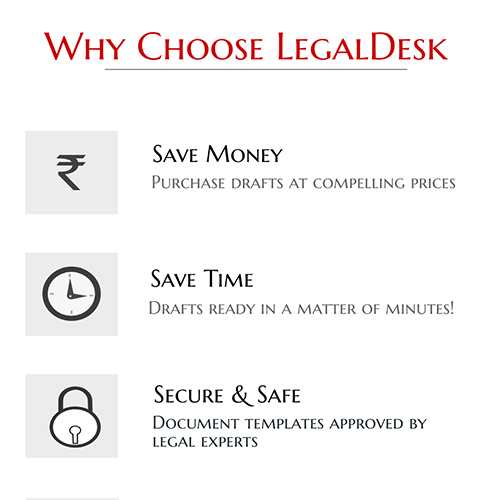 At LegalDesk.com, you can prepare an affidavit for change of name after marriage in a matter of minutes. We have a pre-drafted version of the said affidavit. All you need to do is fill in your details and print! Once you make the affidavit for change of name after marriage, you need to swear before a Notary or a Magistrate. Use simple instructions based navigation and complete the affidavit in less than two minutes on our website. Since it may be difficult to get an appointment from a Magistrate, you can approach a Notary for his signature, which is equally valid. Print the content on a Stamp paper of the required value (the Notary will advise you) and get it attested and sealed by a Notary. In case of an Indian living abroad, the person shall submit an affidavit duly attested by the respective Indian Embassy/ Indian High Commission. One classified should be on a daily newspaper in the local official language of the state. You can make use of our service to avail Newspaper Publication service for your name change or you may opt for a complete Name Change Package. Eg: I, Rani Srivatsav, W/O Nirmal Khanna born 15/08/1987, residing at 468, C.M.H Road, Indiranagar, Bengaluru – 560 038, have changed my name as Rani Nirmal Khanna vide affidavit dated 11/12/2014 deposed before Notary Manjula Gurumurthy. Tip: Since most of the newspaper houses have multilingual publications in the same state, ask for a package (for classifieds in English & state language) that will help you save money and time. IMPORTANT: Gazette Publication is mandatory for Government employees and optional for others. In some states, you can get the name change published in the official state Gazette. This is not a statutory requirement in some states. For example, in Karnataka, the Gazette publication for name change is only applicable to state govt. employees. You can approach the controller of publication, Govt. press in your state and get details on the procedure. You may be required to produce some vital documents along with the original affidavit to have the details published in the next Gazette issue. Central govt. employees can get in touch with their departmental HR contact for further guidance. Apply for name change with various banking institutions, Govt. agencies( like voters id, PAN card, passport) for change of name. You may be required to fill a separate dedicated form along with producing the affidavit, newspaper copies supporting name change. The sooner you update your name with these sources, its better for your future. Print the prepared affidavit on non-judicial e-Stamp of recommended value. Place your signature at the bottom of the page. Affix a passport size photo of yourself on the page. Get the document notarized and sealed by a notary. Once these steps are carried out, your name is considered to be officially and legally changed. This affidavit can then be used as a valid proof of your name change.